As a part time trader & investor, I strictly use end of day data for my screens and scans as I don’t have the luxury of watching the tape all day long (nor do I want to). With that said, I do receive text alerts if a buy signal is made or if a sell signal has been violated. Using my smart phone or tablet, I can and do trade during business hours (when absolutely necessary) but it’s not imperative. I encourage investors and traders in all time frames to evaluate stocks for investment using both fundamental and technical analysis. A day trader and even a swing trader can get away with avoiding fundamental analysis but I highly recommend both methods of analysis for intermediate and longer term trend traders and investors. Both tools are equally important in making serious decisions with your hard earned CASH! The criteria listed in this section can be used together or arranged in a variety of ways to generate multiple screens containing all possible opportunities. Get a feel for specific screens and determine which are the most successful during certain market conditions. Fundamental screeners will scan thousands of stocks narrowing down the universe to a couple dozen to a few hundred each night or weekend. The more bullish the market, the larger the list of stocks will be and vice versa for weak markets. From here, the savvy investor turns to technical analysis to identify “when” and “where” to place a new position for the ideal risk-to-reward ratio. Determine if overall market is in a specific trend (up, down or sideways). Use multiple moving averages to quickly determine the trend. Evaluate sister stocks or stocks within the same industry group (strength travels in groups so the probability of success rises when buying into a strong industry). It is extremely important to pay attention to the quantity of stocks making your screeners from time to time. The length of the list alone will tell you how healthy or how weak the market currently is, without even checking another factor. For example, a standard screen of mine searching quality stocks making new highs should be full of candidates during a fresh up-trending market. The list should be full of candidates as long as the trend continues. As soon as this list starts to thin out on a daily and weekly basis, become cautious that the breadth is weakening. When scanning these screens, I will view the stocks in descending order starting with the day’s largest price percentage change and occasionally starting with the day’s largest volume change versus 50-day average. Although I run these screens at least once per week, one or two will come into favor while others fall out of favor depending on the market environment or situation. Over time, the strength and weakness of certain screens will also give you a hint as to what the overall market is doing (another breadth signal). For example, a screen that locates quality stocks making new 52-weeks highs is best used when a market is forming a new up-trend and the overall movement is still fairly fresh. This screen is less important near the end of a strong up-trend because at this point, many of the stocks making new highs are exhausted. The trader will see more failed breakout attempts, reversals and late stage bases so the odds are no longer in favor of this screen. In strong up-trending markets, one cannot expect to buy every stock that makes the screens so it comes down to developing a risk-to-reward calculation to grab shares in the equities that show the greatest upside. Lastly, it’s important to understand that no investor is perfect and losses are part of the game when it comes to investing and trading. Most traders will have as many winners as they do losers (using successful screeners) so having sell rules is critical for sustainable success. Learn to cut losses short while letting winners run, no questions asked. By cutting losses, you account will not blow-up and you will be around to trade another day, especially when your screens are screaming buy! President Barack Obama has been reelected as the President of The United States of America and many investors remain concerned that they don’t know what to expect in the years ahead. None of us have a crystal ball but we can always fall back on reliable charts, indicators and historical analysis to help give us an edge. Historically speaking, November, December and January are the year’s best three-month span in terms of overall percentage performance for the S&P 500 (data from 1950 through today). Similarly, the NASDAQ is historically best from November through January with an extended positive trend running through to June (data from 1971 through today). The Stock Trader’s Almanac states that the year-end strength comes from corporate and private pension funds. There are a couple of things to consider before backing up the truck and investing in stocks. It is very important to understand that fiscal policy, the taxing and spending power of the Federal Government, may be the most powerful influence affecting the nation’s and many times the world’s economies. Now, Bernanke and The Federal Reserve do not have the power and mechanisms to control movements in money with accuracy over the short term but they often tip their hand and lend a clue for long term performance. In addition to The Fed, unique cycles occur within markets, such as the 4-year presidential cycle and we know by studying the markets that recessions typically occur in years between presidential elections. With the 2012 election behind us, we will now be headed into that territory; however, we also saw what took place during President Bill Clinton’s second term (boom). So use history as a gauge with relation to what’s happening today and not a full-fledged prediction tool. Macro cycles clearly exist so I suggest you become familiar with their tipping points and seek action when opportunity becomes favorable (I will highlight some techniques below). Although the Federal Reserve has enacted a policy of near free credit, the private business sector in the United States is deleveraging. It has been argued that the business sector has been accumulating large surpluses of cash reserves since the meltdown of 2008-09. One can argue that this deleveraging is responsible for the poor economic activity over the past several years. American businesses and individuals to some extent are more concerned about repaying their debts than discretionary spending. This is the main reason why The Fed’s generous monetary policies have been mostly ineffective. Some analysts have suggested that the deleveraging (debt reduction) may continue for another 4-5 years which would extend the length of Obama’s entire second term. If that is the case, interest rates should remain low and prove that additional stimulus will provide little to no spark to an already sluggish economy. I don’t know how unemployment will turn out but it benefits us all if these figures improve so consumer spending can edge higher thus creating further job opportunities. Will we face a period of hyperinflation or complete deflation? I don’t know and I can’t lead my life based on “possible doomsday scenarios”. One may believe that I am tilting to the bearish side on the macro perspective of the market but that is not the case because there are two sides to investing: Fundamentals and Technicals. Up-trends and down-trends will form in the market regardless of marco bear and bull cycles. So, I will keep investing in strong American companies via the stock market regardless of any pending “fiscal cliffs”. As far as the fiscal cliff is concerned, I’d like to believe that Washington will figure something out, at least in the near term (next several years). It behooves us all. Moving on, investors should know approximately when to expect opportunities to buy stocks at relatively low risk by using technical analysis to recognize these opportunities. The fundamentals usually point us towards “what” while the technicals usually tell us “when”. In buying young, innovative and profitable American companies, I am looking at holding their shares from anywhere between 6 and 36 months. Ideally, the average position will last from 6-18 months as I am not in the business of trading or flipping for a quick profit. I have a full time career so short term focus on the market is kept to a minimum these days. As highlighted in the past (on this blog), we must look towards a few simple charts that will give all investors a fantastic risk vs. reward setup/ signal. By following these simple charts, any investor should be able to consistently outperform the market (buy when the market is deeply depressed and sell when it becomes over-bought). Please keep in mind that these signals are for longer term investors as they only appear once every year or so. 2. 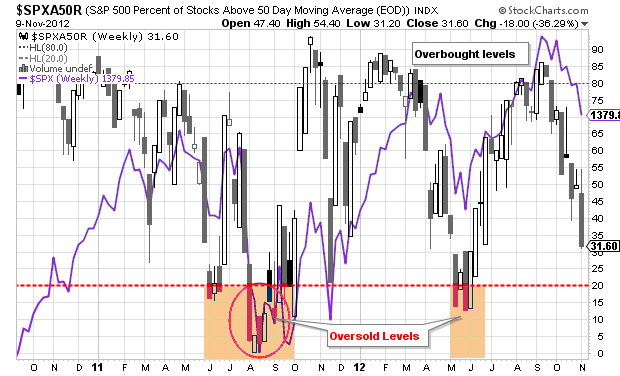 The % of stocks above the 50-day moving average for the S&P 500. I consider this first chart the most powerful of the three (because of the sheer magnitude of the weakness or strength charted among individual securities) for gauging the overall risk level for accumulating shares in the market. 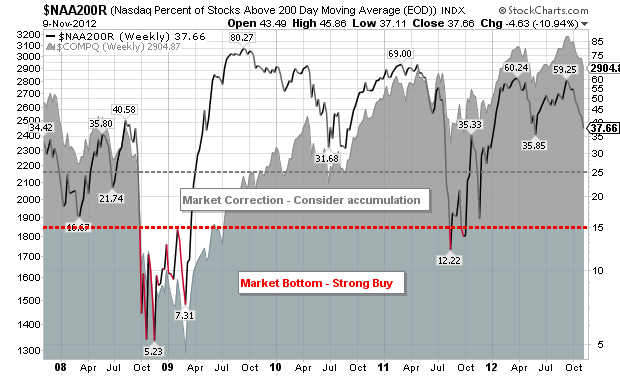 The chart highlights the NASDAQ percent of stocks above the 200-day moving average. It is a rare occurrence when only 5%-15% of all stocks are trading above their 200-day moving average on one or more of the majors indices. Think about that for a moment, the idea of having 85%+ of all stocks trading below their respective 200-day moving average. This level of depression shows that the market is likely close to a bottom and is providing a nice risk-to-reward accumulating opportunity. The levels reached in late 2008 and 2009 were near historical lows and provided one of the best opportunities to accumulate shares in recent memory. In fact, the percentage of stocks trading above their respective 200-day moving averages (on the NASDAQ) in late 2002-2003 only fell as low as 12.29%. As you can see on this chart, the levels reached in 2008 and 2009 went as low as 5.23%. 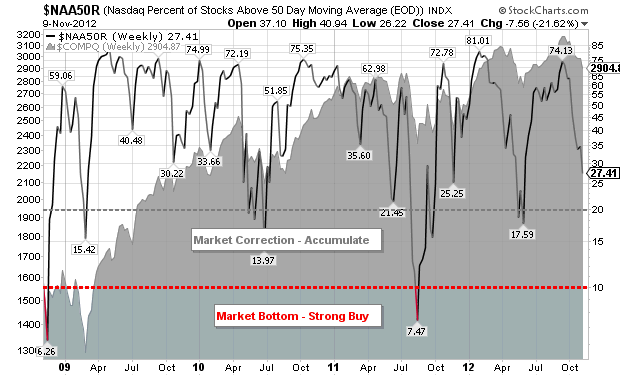 In other words, nearly 95% of all NASDAQ stocks were below their 200-day moving averages. If that doesn’t scream buy, I don’t know what does. By using the second chart, we are looking for the S&P 500 percent of stocks above the 50-day moving average to cross below the “20%” oversold level. Historically, this is a level that signals a lower risk environment to commence accumulating shares in leading stocks. Please note that oversold levels for the general market can last for a period of several months so please be patient with your buys. 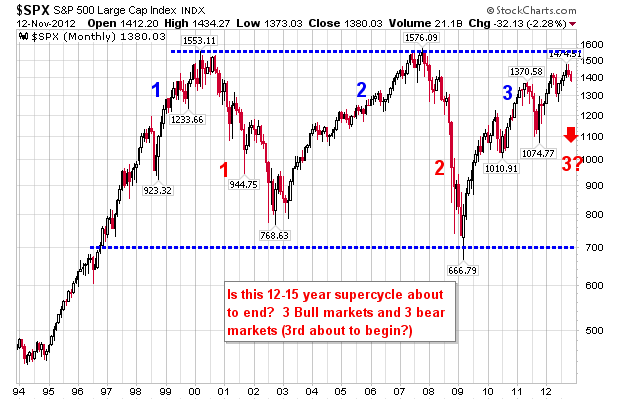 Investors do not have to buy as soon as this level is breached and the summer of 2011 serves as a nice example. Similar to the second chart, the NASDAQ percent of stocks above the 50-day moving average also triggers a nice risk-to-reward environment for accumulating shares. The investor would be wise to start accumulating shares when the percentage of stocks drops below the “10%” oversold level. Late 2008 through early 2009 and the summer of 2011 serve as the most recent examples. With the above in mind, continue to monitor these charts and have the courage to buy when “blood is running in the street”. Investors must have the courage and intelligence to buy when markets are beaten down and individual securities are collectively trading near lows. A completely separate post would be required to discuss “which stocks” to buy at these depressed levels but a quick rule of thumb is to focus on the market leaders, ones showing strong relative strength and earnings growth. Looking at the current readings on all three of these charts, I can confidently venture to say that we are not in the prime low risk accumulation phase of the market. We appear to be heading in that direction but we are nowhere near a major bottom. Keep an eye on fiscal policy, economic indicators such as unemployment, consumer spending and the three charts above. By doing this, every investor should be prepared to accumulate shares in a favorable, low risk environment.